Proclaim your faith proudly by representing your spiritual community online. Belief is one of the most important ways you define yourself. You’re part of a spiritual community because you want to share your faith with a group of people who uphold the same values. Make it easy for others in your area to join your community by creating a professional, eye-catching website with Celect. We’ve worked with hundreds of churches to develop website designs that represent the message of their faith and offer easy paths for visitors to find the resources they need. A website that consistently represents your faith community's message. Celect makes community networking simple by clearly defining how each part of your faith community connects online. Faith communities with national and international reach are united under a common belief system—but what if you could enrich this relationship by forming enriching personal connections with those who share your faith, no matter what the distance? By networking your churches and faith communities, your faith grows stronger as you cultivate relationships with those who share your belief. 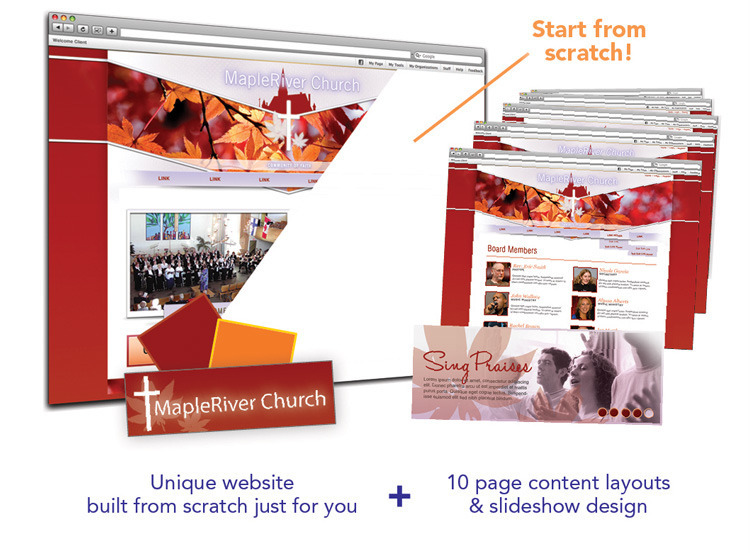 Shared pages for local church websites ensure the message of your faith stays consistent online. Give your local churches the opportunity to take advantage of big discounts on their own websites. Syndicate faith-based news at the regional & national levels down to local groups. Communicate and plan online between local churches and the regional and national offices. Congregation shouldn't be limited to just at church. The ability to communicate online has revolutionized the way people of all ages, faiths, races and cultures touch each other’s lives on a daily basis. You can unlock that power within your community with Celect’s private social network, a free platform included when you purchase a website with us. Celect’s member management tools give each member the opportunity to create his/her own profile and use features like groups, forums, messages, events, newsfeeds and more to enhance communication and planning for ministry, charity, community activism—and anything else you can imagine. It also helps you stay in touch with church members who have moved on to other areas of the country. Collect donatins & tithes directly through your secure payment portal. Post ministry policy documents to give members easy online access to resources. Share photos & videos from recent events, and upload worship music and recordings of sermons. Keep members updated on faith & church news. Traditionally, websites have been managed by tech experts with programming and coding experience—but now you can maintain and update your own website without extensive tech expertise with Celect’s content management system (CMS). It saves your church the money, time and resources you’d otherwise have to spend on hiring someone with heavy tech experience but still gives you the opportunity to have your own website with which you can spread the message of your faith. The more you know about your members, the more enriching your connections become. A faith community gets closer when all your members know each other. That’s the theory behind Celect’s personal profile feature, which gives your members the ability to display useful personal information that can only be viewed by other members. Connections are much more fulfilling when you’re able to browse information like interests, careers, addresses, contact numbers and more—all from a central, secure place. Each Celect website comes standard with a built-in database that gives church leaders the ability to collect volunteer, ministerial and tithing information on each member. That way, you can tailor how you interact with each of your members in a much more personal, engaging way. Tithing and donations can extend beyond weekly worship services. Weekly worship services don’t always reach your entire member-base; if members of your faith community are out of town or working, they can’t always congregate in person. Members of your spiritual community understand the importance that tithing & donations have in keeping those personal belief connections alive through your church or faith community. Give them the opportunity to help outside of your usual congregation schedule with secure payment processing, a service Celect offers through our partnership with Braintree, a PCI-compliant payment processor. Collect weekly tithes quickly and efficiently. Manage donation campaigns and recognize donors for their contributions. Process payments for retreats and other social or charitable activities.